I saw a lot of those on the clearance shelve's after Xmas when I was runnin' around scooping all that dirt cheap 3 3/4 stuff, but never 10 bukcs cheap. Maybe $14 was the lowest. Nothing beats cheap crack! A. Marvel has pretty much confirmed that somebody is gonna die in Infinity War. B. It has been widely speculated that it's Cap, and Bucky will take his place. C. I'm pretty sure The Vision will die when Thanos rips that stone out of his head. D. You make your own speculations. E. Don't stress it, wait four weeks, and see for yourself in, Marvel's INFINITY WAR! Coming soon to a theater near you! That Vader is pretty neat Cobotron, and I couldn't pass him up for so cheap. Here's my desk dudes for the day. Saying it now, Stark "dies". He did recently in Civil War 2, and I think recently RDJ mentioned he'd be ok with moving on a la Hugh Jackman's Wolverine. I think..speculation abounds!! In other news, I may need to hit up TRU for some of their exclusive Marvel Legends figures.. It has been brought to my attention by me that I didn't post a picture from last week. I just finished re-reading the "Goblin Nation" story arc so I felt this was appropriate. Would it have been better with flight stands? Of course!! Do I have any? NO!! So here's the desk crew today. That dang Rinzler, terrible articulation. It's cool that he lights up, in the torso, woulda been cooler if the whole dang thing lit up. Shoulda brought Clu in. That feature he has is pretty dang nifty. Contemplating ordering a Transformer. Just not sure what. I think I'm burned out..I know that's a sentiment that has been gaining steam. Does Clu have the cool light up face gimmick? I recall figures that had a face projection on their visors. Did Uprising have toys? It might have been for them. Clu does! Sam did too. Sculpted details are nice but the finish of the figures is lacking. Lots of scuff marks for no reason. I don't have Sam, but he's still relatively easy to find. Updated the Sales thread, a few bots were saved from it last night, including these two! I went back and forth on Excellion a lot, and TR voyager Megatron and Galvatron as well. I really enjoy this Galvatron figure, so he kinda made voyager Megatron stay by default. I mean, what a perfect evolution!! They might both take up residence on my desk. Something else happened over the weekend. Yet another issue with MP9 based Rodimus Prime. What's funny is I've never had the exploding knee issue!! Luckily I have two so I can swap things around if needed. Currently I have one with a scuffed up front pelvis, no wing, broken front canopy hinge. The other is in good shape though!! DX9 Carry pre-order is set! Can't wait for that guy. I think he'll be worth the extra money over PotP Rodimus Prime. D-Maximal_Primal wrote: Noooooooooooooooooooo that poor spoiler! Just one of the many things wrong with MP9, D-Max! carytheone wrote: needs a spoiler warning. Actually, I think it was I who required said warning of spoiler! These guys like chillin' together. Hot Rodimus is rolling fine today.. I did notice chrome wear on his exhausts!! Dang it. I was looking at the picture saying "what is that orange highlight there on the exhaust? CHROME WEAR?!" He's one of my most transformed MPs though, so it's understandable. Sort of annoying though. I also think I'm going to try and shave down the handle pegs on Firebolt just so he stays in hand better. More pictures you say? Sure. Maybe I won't modify the gun handle after all! Also, you kids watch Justice League? I finally did this week. Overall, it was good. Obviously some parts could be changed, but I had fun and I'm happy I own it. Suicide Squad will be here tomorrow, another I hadn't seen yet. Black Panther comes to Blu-ray on May 15th!! These pictures make me even more anxious for my MP-40 Cram! D-Maximal_Primal wrote: These pictures make me even more anxious for my MP-40 Cram! I'm still not sold on the paintscheme for MP40. 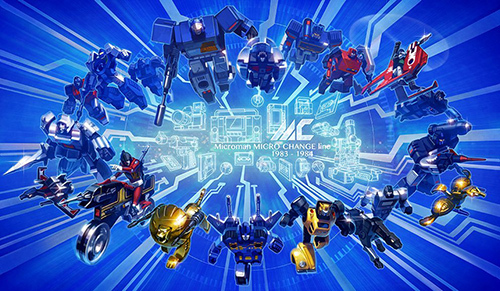 I'm glad you're getting him, and I hope to Primus they fixed his rolling/not rolling in alt mode! Justice League was definitely not Avengers level, but we didn't have the world building completed yet like Avengers had by the time it came out (in continuity). So it gets a pass on that, but I'm looking forward to more! Here's the desk crew today. Bumblebee joins me today, with his DotM deluxe head swap. Until I find DotM Bumblebee's arm, this is where his head shall stay! In other news, my Reprolabels w/spoiler for DX9 Carry have shipped. I'll have them ready for his reissue in June! Huzzah!! itscramtastic wrote: In other news, my Reprolabels w/spoiler for DX9 Carry have shipped. I'll have them ready for his reissue in June! Huzzah!! itscramtastic wrote: Bumblebee joins me today, with his DotM deluxe head swap. Until I find DotM Bumblebee's arm, this is where his head shall stay! That works really well! I didn't get the regular DotM deluxe, but I do have the Nitro version! D-Maximal_Primal wrote: That works really well! I didn't get the regular DotM deluxe, but I do have the Nitro version! It really does. I think I'll bring the standard release for comparison shots tomorrow. So D-Max, I didn't bring in that other Bumblebee. I left all the 'Bees at home. I think I need to sell all the 'Bees and get the Wasp. 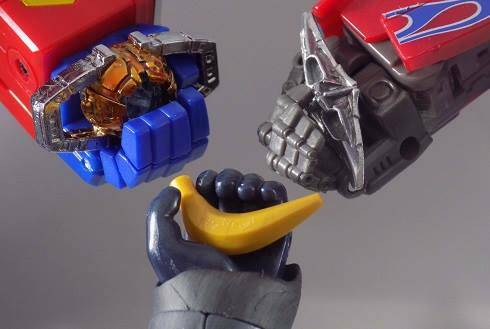 Instead, I tightened up some joints last night on TR Chaos on Velocitron's voyager Laser Optimus Prime. Why? He could hold Cloudburst in weapon mode. Worked out pretty well. Last edited by Scramjet on Wed Apr 18, 2018 10:55 am, edited 1 time in total. DANG I love that Lazzzzzer Prime!! Cobotron wrote: DANG I love that Lazzzzzer Prime!! He is pretty nice, and Cloudburst's decoy armor works great with him! Hooray for things that are also weapons!! You should get that MPM Bee Cram, he is quite sweet! D-Maximal_Primal wrote: You should get that MPM Bee Cram, he is quite sweet! It's in the works D-Max!! 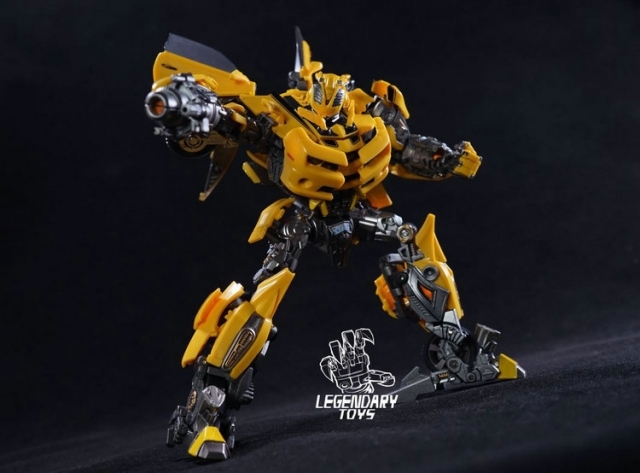 I think I'm going the Legendary Toys Wasp route, I'm not a fan of paying more than MSRP on figures if they aren't readily available on the primary market. BTW, that's part of Combiner Wars Megatron's gun. The best gun for him is from Generations Crosscut, his smaller blaster thing totes works as de time stoppa. 4,954 pages were recently viewed by 1,015 unique visitors. This page was viewed 1 times on Friday, April 19th 2019 4:13pm CDT. © 2019 Seibertron, Inc. DBA Seibertron.com. All Rights Reserved. Established June 2000. Seibertron.com is owned by Ryan Yzquierdo.